O God, who were pleased to award the palm of martyrdom to Saint Fidelis as, burning with love for you, he propagated the faith, grant, we pray, through his intercession, that, grounded in charity, we may merit to know with him the power of the Resurrection of Christ. Who lives and reigns with you in the unity of the Holy Spirit, one God, for ever and ever. St. Fidelis was born at Sigmaringen in Swabia in 1577. He practiced at first as a lawyer and so took to heart the cause of the needy that he was known as the poor man's lawyer. Then he joined the Capuchin Friars Minor and was sent by the Holy See to the Grisons in order to bring back the inhabitants of this canton from Protestantism to the Catholic faith. His great influence earned him enemies; he was murdered at Seewis on April 24, 1622. Fidelis has been called the "protomartyr of the Capuchin Order and of the Propaganda in Rome." He was born in 1577, became a renowned lawyer. But feeling that this profession endangered the salvation of his soul, he decided to join the Capuchin Order and employ his extraordinary gift of eloquence in urging the faithful to lead holy lives and in bringing heretics back to the true faith. An ardent admirer of the founder of his Order, he was a great friend of poverty. Severe with himself, he was most considerate towards others, "embracing them like a mother does her children." When the Austrian army was stricken by plague, he cared for the spiritual and bodily needs of the soldiers in such a manner that he was honored with the title, "Father of the Fatherland." His devotion toward the Mother of God was truly remarkable. Trusting in her intercession and that of other saints, he often begged God for the grace of sacrificing his life in vindication of the Catholic faith. The occasion came when he was appointed to lead the mission for the conversion of Grisons (in Switzerland); heroically he suffered a martyr's death and sanctified with his blood the first-fruits of martyrdom in the Capuchin Order (1622). Symbols: With a club set with spikes; with a whirlbat; heretics; with Saint Joseph of Leonissa; trampling on the word heresy; with an angel carrying a palm of martyrdom; the Morning Star. 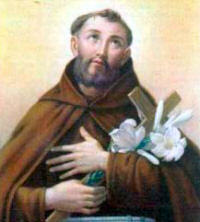 Read this life of St. Fidelis from EWTN. Since St. Fideles was an excellent preacher and was chosen by the Congregation for the Propagation of the Faith to combat the heresy of Calvinism maybe you might study a little apologetics to prepare yourself to defend the Faith. You can start with these two sites: Calvinism and A Tiptoe Through Tulip. On May 2, 1940, Pope Pius XII raised to the ultimate honors of the altar a most remarkable woman, Mother Mary Euphrasia Pelletier. As the solemn Te Deum swelled in gladness through the Vatican Basilica, its joyous strains were echoed and reechoed in quiet chapels found in virtually all the large cities of the world. Almost a hundred thousand women and girls and over ten thousand white-robed Sisters, in three hundred and fifty homes of charity, rejoiced with their Mother, the new Saint. 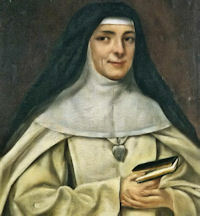 For Saint Mary Euphrasia Pelletier is the Foundress and first General Superior of the large Congregation of Our Lady of Charity of the Good Shepherd of Angers, and one of the great sociologists of the ages. Rose Virginia Pelletier was born of pious parents on July 31, 1796 on the island of Noirmoutiers, during the terrible period of the French Revolution. So it was that her life began as a daughter of the suffering faith of her beloved France. Because of the suppression and expulsion of religious Orders, the education of the little girl had to be undertaken by her busy mother. At her knees Rose Virginia learned of God and His service. In 1814 she entered the Order of Our Lady of Charity of the Refuge at Tours. After ten months as a postulant in this historic community at Tours, Rose Virginia received the habit and entered upon her life as a novice in September, 1815. For two years she remained in the novitiate, being formed to the religious life, studying and absorbing the history and work of her Order. Listening to the life of a Saint one day, she heard that he quickly attained sanctity by his perfect obedience. “Obedience, then,” reflected the young novice, “must be the best means to become holy. If only I might take the vow of obedience at once!” Sister Mary Euphrasia consulted her superiors, and was permitted to take a private vow of obedience. In 1817 she was professed, making then her first public vows. In a few years her exceptional qualifications became so apparent to all that after having been Mistress of penitents, she was elected Superior of the house. A project which had been in her mind for a long time was then made a reality. She had found in many of the penitents a real attraction for the religious life, with no desire to return to the world after their conversion. Where could they go? It was very difficult, virtually impossible, to find a congregation suitable for them or willing to accept them. So Mother Euphrasia inaugurated a community called the Magdalene Sisters. She adapted the rule of Saint Teresa, drew up a set of Constitutions, and erected the first community of Magdalenes in the house at Tours. One of the greatest consolations Mother Euphrasia enjoyed in life was the sanctity attained by so many of these religious, bound by vows to a life of prayer and penance. During the thirty years she was Superior General, Mother Euphrasia sent out her Sisters from their mother house at Angers to found one hundred and ten houses in every land beneath the sun — Sisters inflamed with her own zeal, trained at her hands. She died at Angers in her seventy-second year, having welcomed death with the faith and serenity which marked her entire life. Read more about St. Rose at the CIN website. You can read the Life of Reverend Mother Mary of St. Euprasia online here. Brothers of St. John of God care for the sick and those in need. For this reason, from the very beginning, the Hospitaller Order was recognized by the Church as a Congregation of religious brothers with exception of not more than one priest in each community acting as chaplain. 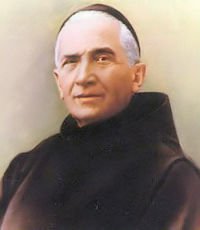 Saint Benedict Menni was one exception, being an ordained priest in Rome on October 14, 1860. In those years, the Spanish branch of the Hospitallers Order died away as a consequence of some Masonic laws issued in Portugal in 1834 and in Spain in 1835. Saint Benedict was sent to Barcelona on April 6, 1867, to restore the Hospitaller Order in these countries. After a long struggle, oftentimes risky, he was not only able to gather many vocations - almost a thousand from 1867 to 1903 - but also founded in Spain, Portugal and Mexico, 22 hospitals for every kind of sickness, especially for mental patients and handicapped children. Those conditions were the most neglected by the public health care at that time. He also founded a female branch of the Order, the Hospitaller Sisters of the Sacred Heart of Jesus. Today, the Sisters are present in 20 countries with almost 80 communities. What is amazing in the life work of Saint Menni is the number and complexity of the undertakings he faced; but, even more so for their validity, tested for more than a century. The secret lies in his true, heroic detachment by which he always considered himself a docile instrument in the hands of God, without giving room for his personal ambitions or human plans. His feast day is April 24, the day he died in Dinan, France, in 1914. © The Hospitaller Foundation of California, Inc.
Read more about St. Benedict Menni at the Vatican website. Learn about the Sisters Hospitallers here. The "The priest who changed the way we treat the mentally ill" at the Catholic Herald.